In just few weeks, the forces of the Soviets and Americans --- two victorious nations in a “precarious” alliance --- will be controlling the country; the Soviets in the North and the American in the South. This is in accordance to the Yalta Conference held in February of that year. First the Soviets forces followed by the Americans; both entered the country to establish separate areas of control after the dropping of the atom bomb ended the war. 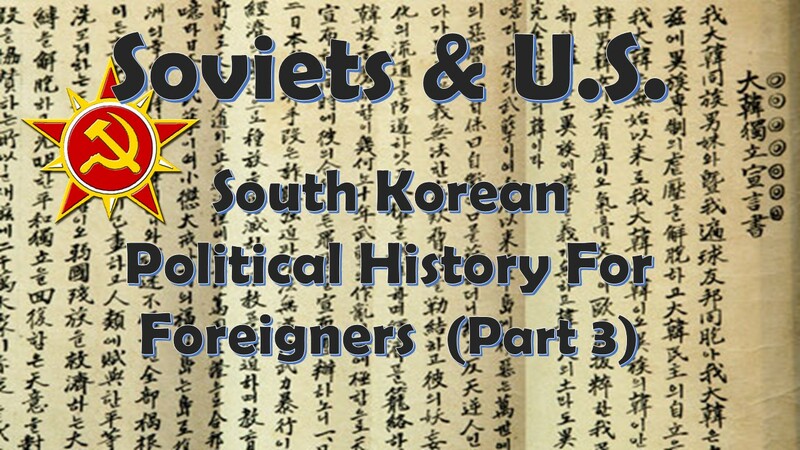 To be more accurate, the Soviets entered Korea even before the surrender. Avoiding to engage the Japanese until the western front was won, the Soviets officially went to war on August 9, 1945. And basically overrun the already demoralized Japanese forces in China until they entered the North part of Korea just days prior to the surrender. It took more time for the Americans to arrive as they were taking care of Japan first; they entered about mid-September. Quickly, the Soviets aggressively used their troops to take control of the North. This involved gestures of cooperation with local communists and, on the other hand, inserting Russia-educated “Stalinist” Koreans into the political landscape. Prior to this new faction coming into the picture, the communists in Korea were mostly home grown idealists more close to “Leninist”. And you know what Stalin did to those folks. The Stalinists led by the “good old great leader” Kim Il-sung --- you might have heard about this guy or at least his grandson Kim Jong-un --- were brought in to give an image of self-governance by the Koreans in the North while basically turning it into the vassal state with Kim Il-sung as its leader. Long live our “king” --- wrong term --- “leader”, “President”, or “chairman”? It is the best of both worlds for the Soviets although this process would take about a decade and would only be completed after the Korean War. The Stalinists still needed the cooperation of the local communists until they could solidify their control. On the other hand, it didn’t take too much time for most of the democrats and a lot of the tribal nationalists to suppressed and ultimately purged; confiscation of property, public shaming, ideological re-education, and kangaroo courts. You get the picture. Over the next few years, many would flee to the South across the “then” porous borders. It would take a few years until that iron curtain was completely put up. Whatever you say about the Soviets in the North, you have to admit they were doing a pretty good job at getting their objectives completed. The opposite can be said about the Americans in the South. They officially took over the place starting around the middle of September of the year – basically a month after the surrender. Unlike the Soviets who at least tried to put on a fake image of regional self-governance, America didn’t camouflage the fact that they were directly taking control by stating that the U.S. military was taking over all government duties until an official government of unified Korean could be established. Rational reasoning but it is just bad optic! This made it difficult for the US to deflect criticisms that inevitably follows trying to run a mess of a country like Korea at the time and try to build it up. There is dirty work that needs to be done. It is a thankless task but it is required. However, things can get messy! After the initial political chaos previously mentioned, the political dynamic in the South settled into the 3 faction conflict with the tribal nationalists in the middle trying to play both sides or, in kinder terms, form some kind of unity between the communists and the democrats. Initially, the three factions fought about the superpowers arrangement to separately govern the country. The democrats were the weaker one during this time as the communists and tribal nationalists had common ground on the subject. It didn’t help that the Americans were rather hesitant to support the democrats as the US was still in its war time Soviet appeasement mode. As you can expect, the streets were filled with protests and violence. People were killed. After a few months, the political dynamic in the South was becoming “Democrats versus Communists” while the tribal nationalists were starting to be marginalized. This is because, as both the Communists and Democrats refusal to work with each other got stronger, the tribal nationalists positon of trying to formulate some compromise --- a slightly Communists leaning compromise if we are being honest --- become increasingly unmaintainable . The Democrats didn’t particularly welcome this endeavor since the Communists tended to use the tribal nationalists as pawns to seed discourse. The Communists --- especially the Stalinists in the North who were increasing their influence over the local communist movement --- didn’t care for the tribal nationalists’ objectives. The will of Moscow were supreme! You could say many things about Kim Il-sung --- the great leader in his early 30s at the time --- but he was competent in his task. As the year 1947 came around, the conflict between the Soviets and US increased. 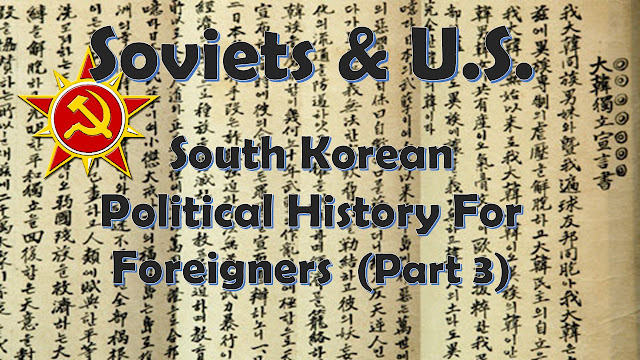 The US wanted to form Korea as a unified democratic nation while the Soviets had different ideas. In many ways, the Soviets had already established their vassal government in the North as early as February 1946. They were not going to give that up unless they could be confident that the whole country would go red. And America wasn’t going to let that happen at this point. The honeymoon was over and the mood between the two allies were now ice cold. Eventually, all negotiations between the Soviets and US broke down and the South would establish its own sovereign government. 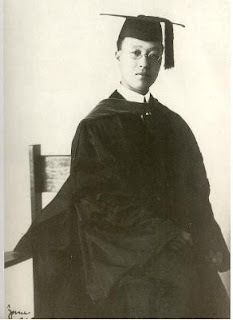 With the Democrats on top in the political scene, the elections for the first Korean assembly was held established on May 10th 1948 and the government was formed on August 15th. While the strength of the Democrats made it possible that Syngman Rhee --- an American-educated democrat --- was elected president, the fight was still not over.